Never mind the specs. Never mind the software. Your Moto X is a beautiful butterfly, unique in the world. Rather, it will be, once you get done designing it. That's where Moto Maker — eventually live at www.motomaker.com — comes in. We caught a very brief glimpse of it at Motorola's launch event in New York City a couple weeks ago. Now, we've gotten a better look at how you'll be able to add some color to your Moto X, with a preview of Moto Maker. The good news is that everything's pretty self-explanatory, and as easy as can be. You pick your colors for the back, front and accents on the phone, add an inscription on the back, and a custom message on the boot screen (or don't, if that's not your thing), choose some accessories if you want, and you'll have your one-of-a-kind phone within four days. Motorola hooked us up with a preview code for Moto Maker. We'll walk you through it. A couple things to remember here. At launch, Moto Maker is only available in the United States, and only through AT&T. Verizon has said it'll get it later this year. Yes, we're unhappy about this, too. It's a really cool feature. We want everyone to experience it. You'll be able to purchase your phone and design it directly through Motorola, if you want. You'll need to provide your account information to take advantage of any upgrades through AT&T. Or, you can pay for your new Moto X in an AT&T store, receive a coupon code, and then design your phone at home. That's essentially what we did here. Presumably it'll work the same once it spreads beyond AT&T. 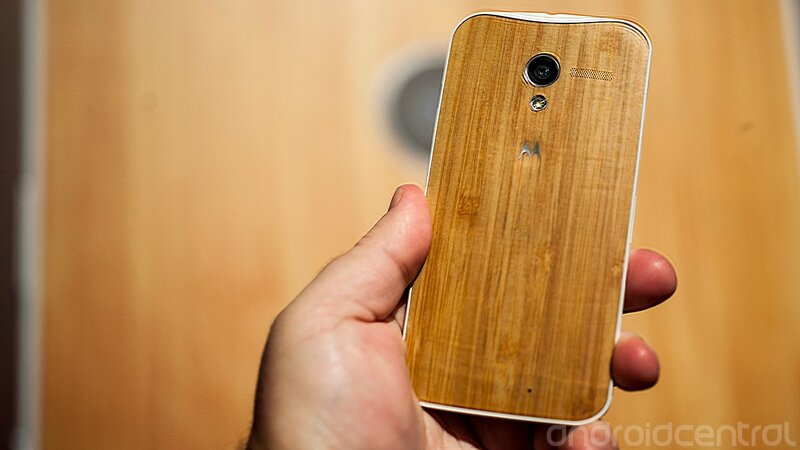 Motorola plans to expand the available designs — yes, that includes a wood back. So if you don't like what you see at first when Moto Maker officially launches, patience might be in order. Because once you order your custom phone, you have an hour to change your mind. There is a a return policy, but you'll want to check the fine print depending on where you live. Have some fun with the custom inscription/boot message feature. It's interesting to see what's allowed and what's not. Be sure to spell-check, too. And then spell-check again. And then have someone else spell-check behind you. Trust us. For a limited time, Motorola's throwing in one of these newfangled Skip unlock tools when you customize your phone through Moto Maker. So. All in all, our Moto Maker experience was quick and easy, with a minimum of up-sell. (We'd recommend squeezing out an extra $50 for the 32GB storage if at all possible.) All in all, a great service for a great device.